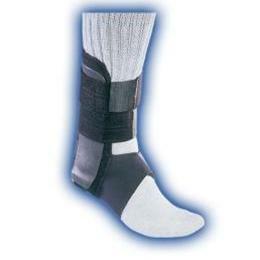 Recommended for protection against inversion sprains. Two polypropylene outer shells connected with a soft foot piece minimize rotation. The single piece design makes this brace much easier to apply, simply place the brace around your foot than you no longer have to hold two pieces together while wrapping the brace. Sleek and comfortable, it is a great support for the softball field or the backyard hoops game.